The farm house L’Oliveto is wonderfully located in a secluded valley, just 3 kilometres from the characteristic hill-town of Trevi and other enchanting Umbrian hilltowns such as Montefalco, Spello and Spoleto, as well as just a few hours ‘ drive from Rome. The singleness of its position, sweeping over the “Valle of Spoleto”, makes it an ideal place for enthusiastic hill-walkers and anyone who wants to relax and enjoy the quietness and the breathtaking scenery offered by natural settings. As its name suggests, the house is set on one of the green groves of olive-trees scattered about the hills surrounding Trevi. The house is equipped with a swimming-pool and a wide range of facilities. The furniture is attractive in its simplicity and comfortableness. An open fireplace in the sitting-room and a big squashy sofa contribute to its atmosphere of rustic simplicity. The modern kitchen, with a wide dining area, is well equipped and has a full-size refrigerator and an electric oven with 5 gas burners. There are two large bedrooms, one of which endowed with a panoramic terrace. They can accommodate up to 6 people. As there are only single beds, this offers a great possibility of re-arrangement. There are two bathrooms, one with shower and the other one with bath. Nous avons passé de très belles vacances. La maison en haut d'une colline surplombe des champs d'oliviers.La vue est magnifiqe et le lieu très calme. Sandro et Elisabet les propriétaires sont charmants et très accueillants. Sono rimasto soddisfatto da questa bella famiglia. "La casa è in un posto incantevole e gode di un magnifico panorama. L'ubicazione è comoda sia per effettuare numerose passeggiate nei dintorni, che per visitare i sisti turistici limitrofi. Per gli amanti della natura e della tranquillità è il posto ideale. Il proprietario è persona molto disponibile e assai gentile." "Cette villa est absolument superbe, magnifique vue , certes un peu compliqué à trouver.Calme , agréable et les propriétaires sont super sympas." Umbria, the so-called green heart of Italy, with its lush, peaceful mountains, hills and valleys, offers a huge variety of gastronomic delights: top quality olive oil, great red wines like “Sagrantino”, truffles, mushrooms, Norcia salamis, farro, lentils, grilled meat, game birds, chocolate, and honey. The typical local asparagus and fennels are not to be missed. Guests will also have the opportunity of tasting l’Oliveto’s first class cold –pressed olive oil, with its typical fruity flavour, along with an excellent white wine, crispy and dry. Both this home-made oil, dry red wine and black truffles (tartufi) are available for sale. The farm house’s unique geographic position will enable tourists to easily reach some of the most fascinating Umbrian places. You'll be enthralled by Umbria's hilltowns with their medieval walls and palazzos, ancient stone streets and vast panoramas of mountains, forests, olive groves, grain fields, vineyards and rolling hills. You’ll explore pink Assisi with its outstanding St. Francis cathedral and Giotto’s frescoes and the famous Sagrantino wine town of Montefalco with Gozzoli’s Renaissance era frescoes. In Bevagna you'll admire the pretty Romanesque piazza, and a jewel like 19th century theatre, and see a public basin where women still wash clothes by hand. Trevi is also worthy of a visit. Dramatically perched up high with 200,000 olive trees covering the surrounding hills, it offers inspiring views in all directions. 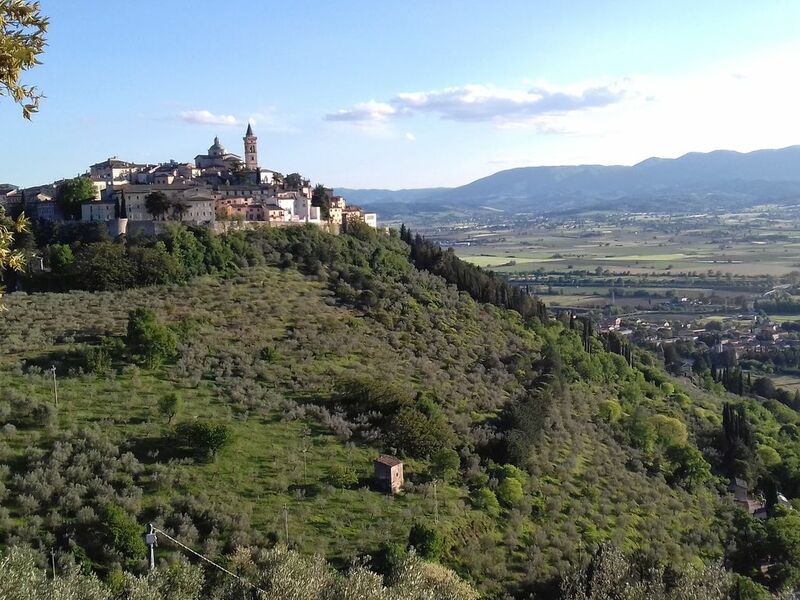 Known as the olive oil capital of Umbria, you will have the opportunity to see there how olive oil is produced and taste oils. Timeless and unspoiled, Trevi is an open-museum, with still visible Renaissance’s details, wonderful winding streets, picturesque alleys and squares to explore. Trevi has got a huge variety of shops, a bank, a post-office, a theatre and even a museum of olive-oil. Rome (Km 141) and Florence (Km 199) are also within easy reach from here and reachable by train.